I'm so excited that we are only a matter of days away from November 1st! For the past week and a half, I have been preparing for those 30 days of feverish writing. I have a beat sheet, descriptions of characters, and settings. So I definitely feel just about ready for the challenge (after I conduct some research). On the other hand, I haven't even started writing and already my novel has changed so much. I keep making new discoveries about the characters and who they really are. My original idea for my first novel won't work because the characters simply wouldn't do the things I expected they would. I think it's amazing how, if you let it, a story can develop a mind of its own and take you to a world even more amazing than you imagined. I think that discovering the surprises in a story has become my favorite part of the writing process so far. Well, I suppose it falls in the adventure category. The MC is a man who is in the drug dealing business. He is one of the big guys in the drug business between the U.S. and Mexico. However, his world is suddenly turned upside down when he is caught and arrested, his lover killed in the process. He is even more devastated when his right-hand man and best friend flees and is nowhere to be found. Not too long after ending up in prison, he escapes and works to reestablish his business and figure out who betrayed his trust. The MC discovers that not everyone is who they appear to be and must deal with the consequences of uncovering the truth. What do you think? It's not so much about his drug business per se, but more about finding out some secrets that change his life and who he thought he was. I never thought I would be writing this kind of story. Honestly, fantasy has always appealed to me way more. This idea just hit me, though, and I decided to see where it takes me. What about you? 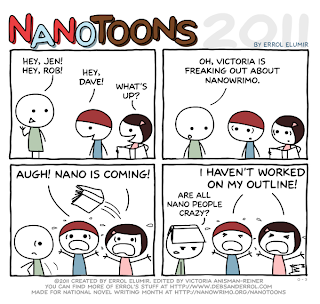 What are you doing to prepare for Nano? Or are you pantsing it? I would also love to hear what your novel is about. Is it your first? Any advice for a newbie?